One of the world's deadliest diseases, caused by the Ebola virus, may finally be preventable thanks to US and Canadian researchers, who have successfully tested several Ebola vaccines in primates and are now looking to adapt them for human use. Dr Anthony Sanchez, from the Centers for Disease Control & Prevention in Atlanta, Georgia is presenting an overview of Ebola vaccine development today (Monday 31 March 2008) at the Society for General Microbiology's 162nd meeting being held this week at the Edinburgh International Conference Centre. 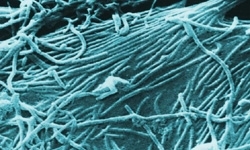 "The biothreat posed by Ebola virus cannot be overlooked. We are seeing more and more naturally occurring human outbreaks of this deadly disease. With worldwide air travel and tourism the virus can now be transported to and from remote regions of the world. And it has huge potential as a possible weapon of bioterrorism", says Dr Sanchez. "We desperately need a protective vaccine". "Ebola virus is a Biosafety Level 4 threat, along with many other haemorrhagic fever viruses", says Dr Sanchez. "As well as the difficulty in getting the right staff and facilities, vaccines for viruses like Ebola, Marburg and Lassa fever have been difficult to produce because simple ‘killed' viruses that just trigger an antibody response from the blood are not effective. For these viruses we need to get a cell-mediated response, which involves our bodies producing killer T-cells before immunity is strong enough to prevent or clear an infection." "Ebola virus infection of humans can be highly lethal but monkeys rarely survive the infection and have been very useful as animal models. Ebola vaccine trials using nonhuman primates have provided unambiguous results and have allowed the development of protective vaccines to progress rapidly", says Dr Sanchez. "Successful human trials will mean that we can vaccinate healthcare workers and other key personnel during outbreaks of Ebola haemorrhagic fever, helping us to protect their lives and control the spread of the disease". The US team hopes that the findings from their studies will provide important insights that will improve or accelerate the future development of vaccines for other haemorrhagic fever viruses like Marburg virus, and agents such as HIV and avian influenza.